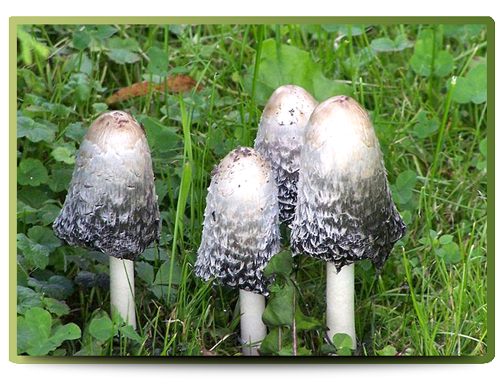 The Shaggy Ink-cap mushroom has a cylindrical cap that is easily recognizable and it covers most of the stem. The cap is pale brown at the apex with white shaggy scales. The free gills change colour from white to pink then to black as the mushroom matures. The stipe varies in length from 10 to 37 centimeters and 1 to 2.5 centimeters thick. The spore print of the Shaggy Ink-cap mushroom is black-brown in colour. The flesh of the mushroom is white and has a mild taste. This mushroom grows in groups and is sometimes found in unexpected places, like grassy areas in towns. The Shaggy ink-cap occurs widely in grasslands and meadows.